A brightly colored climbing plant, Bougainvillea do well in a wide range of climates from temperate to tropical. Many gardeners find that they can be successfully be grown in pots and containers. But watch out for the new cultivars with dwarf, trailing and standards all available for sale. 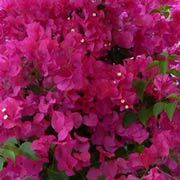 Dwarf Bougainvillea are the latest sold on the market and you can find them under a few names including Bambino Bougainvillea. These are these best variety for growing in pots or even in a largish hanging basket. They are also sold as standards and with a little selective pruning it is not that difficult. Bougainvillea glabra is a species that naturally is smaller growing, it is even used for bonsai, flower colors range from white purple. B glabra is long flowering and a desirable garden plant. 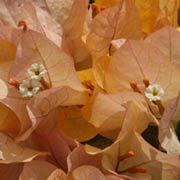 The larger growing Bougainvillea spectabilis has naturally cream flowers and red to purple bracts. The third species is Bougainvillea peruviana is a little more of a scrambler and less dense than the other two, crimson flowers range from light to dark. Repeat flowering. And of course the hybrids between these three. Remember that not all of the dwarf varieties have the same habit, some will reach around 1m and others will get to 3 or 4m, still a lot smaller than the larger types which will easily reach 15+ in good conditions. Bougainvilleas are a climbing plant, and in nature they will scramble through trees, their roots in cool soil, the plant reaching for hot sun. Think of the forests on the Brazilian coast and these are the conditions we try to mimic when selecting where to plant them. As with most plants you ned to prepare the soil first, if you are using pots, then a good quality potting mix is required, and as Bougainvilleas are a relatively hungry plant regular application of a high potash fertilizer will be required. A humus rich moist, but well drained soil is essential for Bougainvillea , a bright sunny position is best but see if you can give the roots a cool spot, so mulch around the base. Remember that they do not like to be disturbed once planted, in fact the roots are quite brittle and are easily broken so take care when planting. Bougainvillea are suited to growing in pots if required. Plenty of water during the flowering period buy be careful not to over fertilize, you will get great foliage and few flowers. Be a little careful with watering, although these wonderful flowering plants do not like to dry out to much, flowering is most prolific in the warmer months when things are dryish. Pruning is another task to be carried out, you can prune twice a year to keep in shape, maintain size, or to train as a standard. Sometimes Bougainvilleas will send up long water shoots, these can be removed. Propagation from cuttings is fairly simple, a semi hardwood cutting around 15 cm in length is easy to strike, try a hormone rooting powder, and keep in a humid, warm shaded position until new growth appears, keep moist. Harden off before planting out. Bougainvilleas will tend to produce more thorns if they are growing strongly. Over fertilisation can cause this as can hard pruning. When the plant is growing rapidly the flowers, that appear on the left axils are replaced by thorns. So if your bougainvilleas are thorny, rather than producing flowers, stop fertilising them and don’t over water them. Another trick into grow them in containers, the root run is restricted and they are more likely to flower a little better. Is there such a thing as a Thornless Bougainvillea? Bougainvillea arborea is almost thornless, and it grows more like a tree as the name suggests. However this is not available in Australia at the time of writing. The dwarf varieties have much smaller thorns. Soil – As long as the soil is well drained these plants are not fussy. Position – Best grown in full sun. Height – The height to which they will grow depends on variety, dwarf types from 1 to 2m, larger types to 12m. Flowers – Papery flowers in a range of colors from white through to red, purple and orange. Flowering is reduced in shaded. Flowering Time – Long flowering in warmer climates, in cooler climates flowering time is spring to summer. Leaves – Foliage is alternate, mid green and on thorny stems. Pruning – Best time for pruning is after flowering. Lack of flowers is usually related to lack of sun, a good 6 hours of sun a day (direct sunlight, not filtered) on the plant itself is the minimum for good blooms. Lack of sun will promote foliage growth. To much water can inhibit flowering. Spring and Autumn are often the best months for flowering rather than the height of summer. If growing in containers make sure that the pot is large enough, but not to large. Almost potbound is the best description. You will need to repot as the plant grows and the potting mix becomes exhausted, however, avoid disturbing the roots. Frosts can knock back bougainvilleas, so try to avoid them. In cooler climates avoid a position in cold winds, this can promote burning of the tips. These plants need sun to flower, at least 6 hours a day, they also like a little humidity. Another factor is when the plant has been heavily pruned, it sort of goes into self preservation mode and puts on lots of new growth, but no flowers. Another theory is that they flower better with restricted root growth, or when they are potbound. So do not use a pot that is to large for the plant. 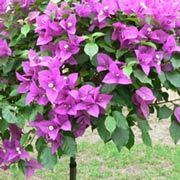 Also try not to over water and over fertilize Bougainvillea as this can also encourages vegetative growth rather than flowers. A little sulphate of potash can help encourage flowering.